Canine (meaning dog) – This disease is unique to dogs and does not spread between species, so a cat cannot contract it from a dog. Infectious – This means that this disease is caused by infectious agents or organisms (in simple language – bugs) which can grow and multiply in the respiratory tract of the host, in this case that of a dog. Tracheobronchitis – The trachea is the windpipe which connects the mouth and nose to the lungs. The bronchi are the small networks of tubes which stem from the trachea taking air into the lungs. Whenever a word ends with “–itis” it means inflammation or infection. In simple language - it is a dog getting a cold. Kennel cough was given that name because it occurs commonly in places where dogs are gathered together in groups such as kennels, pet shops, parks and parlours. This is because it is highly contagious. It spreads via direct contact between dogs, or indirect contact when dogs share bowls; are touched indiscriminately by the same person; or via the air. Thus, similar to the human version of the common cold, it spreads very easily. Kennel cough can be caused by a variety of different “bugs” or microorganisms. These include viruses, bacteria and mycoplasmas. It often involves more than one infectious agent at a time. 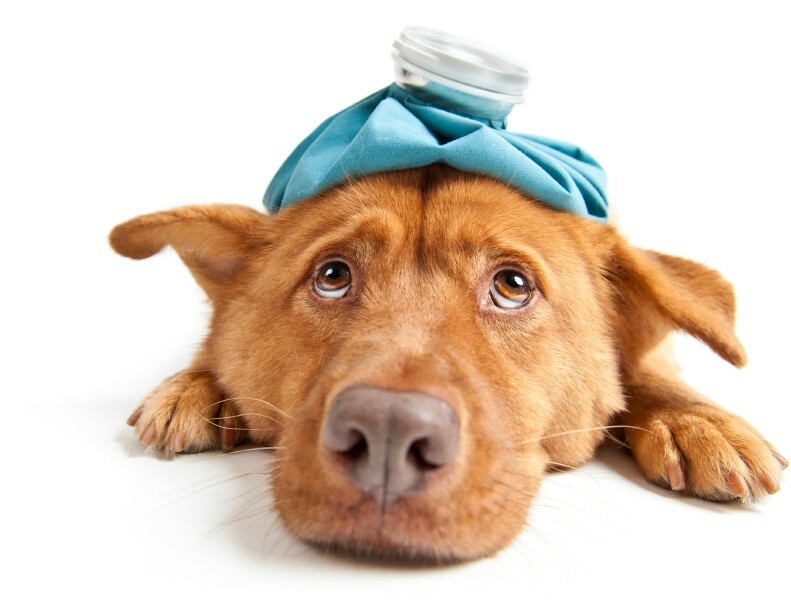 The most common virus associated with Kennel Cough is Canine Parainfluenza virus, but it has also been associated with Canine Adenovirus, Distemper virus, Herpesvirus and Reovirus. Some of these viruses are vaccinated against in the usual annual vaccinations performed by the vet. The primary and most important agent of the disease is however a bacterium called Bordetella bronchiseptica. This bacterium paves the way for the other bacteria, viruses and mycoplasmas to invade. If you were to imagine a war against the respiratory tract, this bacterium is the reconnaissance of the enemy that breaks through the frontlines, and calls for back up from the rest of the enemy’s army. Bordetella bronchiseptica uses the anatomy of the animal to get a foothold with the infection. One of the body’s mechanisms for defence is mucociliary apparatus. This is a system whereby very small hairs (called cilia) project inwards from the respiratory tract walls. These cilia move together like a Mexican wave to push any unwanted debris or micro-organisms upwards away from the lungs and towards the mouth, where they can be coughed up and ejected, or swallowed and got rid of by the digestive system. The Bordetella squadron however attaches to and multiplies on these cilia. It then releases toxins which stop the cilia from working effectively. The Mexican wave is stopped, and all the debris and other infectious agents that are inhaled now have no defense. And so the war begins. Externally, the war can be visualised by your dog suddenly showing a dry, hacking cough or honking cough. Many times at the end of the cough the dog will start gagging and retching and may cough up white mucous. To many owners it may appear as if the dog has a bone or something stuck in its throat and the retching and gagging looks like the dog is trying to cough it up and get it out of the throat. The honking sound associated with Kennel Cough occurs because the vocal cords become swollen and inflamed, so when air pushes between them the decreased space causes a squeaking sound. In most cases the area of the respiratory tract most severely affected is the throat (also known as the larynx and pharynx), close to where the vocal cords are situated. Similar to the human cold, Kennel Cough can be quite mild in some cases and recover without treatment. However it is advised that animals with Kennel Cough be taken to the vet to be examined as they may need varying degrees of therapy. In severe cases Kennel Cough can progress to pneumonia so it should never be ignored. Pneumonia is the name for a true lung infection where the infection can spread from the bronchi, or small air tubes, to the alveoli or air pockets inside the lungs (where oxygen is actually taken up into the bloodstream) and the lung tissue itself. If this happens and goes untreated it can result in death. Because there are other reasons for coughing which look exactly like the symptoms of kennel cough it is worth the while having it seen to by the vet. These reasons include true obstructions where there is in actual fact something stuck in the throat of the dog, some forms of cancer, or even heart failure. Do not presume that all coughing is related to this condition. It is safer if the dog can be assessed by the veterinarian. It may be necessary to perform other diagnostic procedures to rule out other reasons for coughing. These may include a physical inspection and examination of the throat, listening to the lungs with a stethoscope, blood tests, X-rays, examining the cells found in the trachea by means of a special procedure like a trans trachial aspirate (TTA) or even taking cells directly from the lung with a needle and examining them under a microscope. Dogs suffering from Kennel Cough are usually otherwise healthy and still eat normally and play with the same vigour as usual. In most cases they do not have a fever even though infections typically cause a raised body temperature. Sometimes a nasal discharge can be present. This usually indicates a secondary infection, which can be a sign that the condition is more serious. There is a vaccination for Kennel Cough which acts against the primary agent, Bordetella bronchiseptica. It is important to realise that giving the vaccination does not mean that your dog will be totally immune and will not contract Kennel Cough. The vaccination is however a helpful measure to prevent the disease. It is not included in the annual vaccinations, but you can request the veterinarian to give it, and some kennels require that this vaccination has been given before they will allow your pet to board with them. Similar to other vaccinations, this one needs to be boosted a month after its first administration, but thereafter can be given on an annual basis. Treatment for Kennel Cough includes using medicines which help reduce the swelling and irritation in the throat like anti-inflammatories and may also include cough suppressants and antibiotics. All of these medications are not always necessary depending on the severity of the case. In most cases the dog will respond to treatment within ten to fourteen days. It is important that even if your dog is looking better, that the medications be finished. It is also advised that your dog be kept quiet and not be exercised vigourously when diagnosed with Kennel Cough. Most importantly, if your dog has Kennel Cough you must keep him or her away from other dogs for at least one to two weeks. The infection is highly contagious so owners must be conscious and responsible in this regard to prevent spread of the disease. Within a household it is often difficult to separate animals adequately so unfortunately when one animal becomes infected, it is often the fate of the other dogs in the home as well. As an owner the best thing that you can do to avoid Kennel Cough is to get your pet vaccinated and keep him or her away from other animals that are showing signs. If your pet does contract Kennel Cough then it is advisable to go to the vet sooner rather than later, to suppress the symptoms and avoid progression into a more serious condition like spreading into the lungs.